Matthew Carver’s translation of the postils of Johann Spangenberg is a giant step forward in our appreciation of the worship and preaching of the Reformation. Spangenberg as a colleague and friend of Luther did much to popularize the teaching of Protestant theology. What we find particularly interesting in this translation is how it throws light on the practical life of preaching and teaching at the time of the Reformation. It would serve the modern church well to recover this emphasis on teaching the congregation the basics of Protestant piety. The Christian Year of Grace is a solid resource that can be used effectively with youth and young adults. Utilizing its question/answer format like the catechism, it is an excellent resource for teens serious about Bible study or interested in Reformation history and provides a great outline for a youth Bible study—particularly in churches using the traditional one year lectionary, though it can also be a valuable tool in teaching the Bible for churches using the three year lectionary. In addition, it could be an excellent curricular resource for our Lutheran High Schools and universities, perhaps as an elective course. The text may challenge the reader and the reader may come to some different conclusions, but the questions inspire other questions, open up opportunity for conversation, and build links to our historical past. The Christian Year of Grace is also a resource for family devotions and can be a great guide for one’s personal scriptural growth. Not only a luminous window into the hermeneutics and theological thinking of the Reformation era, but a tantalizing resource for our own preaching: Which of Spangenberg’s observations would I—will I—declare from my pulpit today? His questions challenge us: “Do these things still go on in the church?” “Is that how things are?” (pp. 307–8). His answers connect the first, the sixteenth, and the twenty-first centuries. 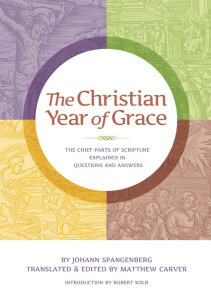 In a world fragmented by multitasking, Spangenberg’s Christian Year of Grace offers readers guidance for fruitful meditation on the texts of Scripture. 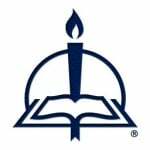 Using the catechetical format of questions and answers, Spangenberg leads the reader through a methodical contemplation of the words and concepts of Scriptural texts read and preached in what is called the historic lectionary. While his interpretative commentary is of great historical interest to the scholar, his clarity and precision in meditating upon the main ideas of the text are helpful to the Christian who desires guidance in reading Scripture slowly, carefully, and purposefully in preparation for worship.